The movie sets in Lord of the Rings set the bar rather high when it comes to creating massive fantasy worlds that your actors can run around in. 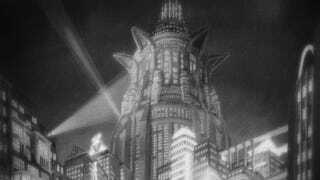 But there have been other incredible, large-scale movie sets — from the disaster of the capsizing boat cities of Waterworld, to the art nouveau dystopia of Fritz Lang's Metropolis. Here are some of our favorites. 4 million dollars were spent to build this set near St. Petersburg. In Tunisia, the Berber town Matmata, the large oasis Tozeur and the fortified granaries named Ksar Ouled Soltane and Ksar Hadada were used as filming locations for three Star Wars episodes. The wall and the thousands of extras cost about $2 million. Here's D.W. Griffith's scrapbook for the movie, with illustrations cut from academic books about archeology, plus the abandoned set after the filming, before it burned down in the 1920s. Mirrors are used to create the illusions of the life-sized city. The process was invented by Eugen Schüfftan. The Skybreak House (designed by Team4, including the legendary Norman Foster) was the home of writer F. Alexander. The home with ancient Maya-based design was built in 1924, and used in various movies: the exterior was seen in House On Haunted Hill (1959), it was a private residence in The Day Of The Locust (1975), and used in Blade Runner (1982) for few seconds. This elliptical house, designed by Charles Deaton in 1963, was one of the places where Woody Allen took a nostalgic look at the future in his 1973 movie Sleeper. The Camp Khitoer from Star Trek VI and a Borg compound in the Star Trek: TNG (Season 6 and 7: Descent and Descent Part II) were filmed here, next to the Sidney Eisenshtat-designed building from 1970. Lots of scenes were filmed in a water tank (with 17M gallons of water) in Mexico, with some small and a full-scale, partially working Titanic model. It's a reproduction of a medieval Prague.